The Phoenix is a mythical Greek bird often referred to as a Firebird, that also features in many other civilisations mythologies too, Arabian, Persian and many more. In looks, the Greek Phoenix was a red and gold feathered bird who’s appearance was so bright it shone with pure sunlight, which accounts for its nickname of Firebird. The tail of the Phoenix was as colourful as its body, with blue, green and purple feathers, that combined would be a sight that could transfix and enchant its admirers. The Phoenix was a tall bird, thought to have stood around three to four feet tall, with slim legs a long tail and an impressive wingspan, made all the more beautiful by its bright colouring and the dazzling sunlight it emitted. In comparison to other birds, the Greek Phoenix was often depicted as a cross between an eagle and a peacock, larger in size than an eagle but slightly more weighty than a peacock. The Phoenix was blessed with an ability to be reborn, with a new Phoenix born out of the death of its parent. The Phoenix would build a next that contained a mix of twigs and spices, and when it was reborn it would rise from its ancestor in a blaze of light and ash. This would occur every 500 years, and the new Phoenix would return to Egypt where it would embalmed its parent from which is rose in an egg shell made of myrrh, and would then bury it in the Egyptian Sanctuary Helios, known as the temple of the sun in Heliopolis, Egypt. 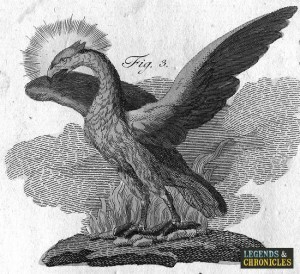 The Phoenix itself is not unique to Greek Mythology, the bird also features heavily in many other cultures and countries across the world, from China where the Phoenix is known as the ‘Immortal Bird’ to Greece where the Phoenix is deemed a symbol of its re-birth.